Thank you for visiting our web site at fortressnw.co.uk. No doubt you are looking for the best package you can find in your search for PVCu double glazing products. Contact us, you have nothing to lose. **Special Offer** - Make your Home A... Fortress. Don't delay phone or contact us now to take advantage of this limited offer. Fortress is based in Greenfield, Saddleworth and is ideally placed to supply and install double glazed windows for casement and traditional sash windows, high quality doors including the high security specification Rockdoor, Conservatories, Porches and Roofline products (Fascias Soffits and Gutters) to North West England, including Greater Manchester, Saddleworth, Oldham, Ashton under Lyne, Rochdale, Sale, Bury, Todmorden, Whitefield, Tameside, Stockport, Cheadle, Bramhall, Wilmslow, Huddersfield, Holmfirth, Yorkshire, Lancashire and Cheshire and other local areas. Fortress can also cover a wider area – for information use the contact form on the Contact page for details. Fortress can also supply and install replacement double glazed units, guaranteed for ten years, into existing PVCu widow frames. 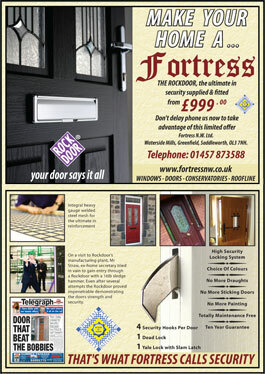 Fortress also has a range of innovative glazing products including: high insulation performance double glazing units, safety glass, self cleaning glass, double glazed units which have integral blinds sealed within the cavity of the double glazed units and a wide range of decorative features including diamond lead, square lead, Queen Ann lead, Jacobean lead and lots of other styles. Fortress prides itself in its high quality and Customer satisfaction – please visit our testimonial pages to read the comments from some of our satisfied customers.